Follow the immigrant trail from a thatched Ulster cottage to a log cabin of the American frontier with costumed characters and family events throughout the year. Cole’s Monument, Enniskillen, BT74 6AJ. 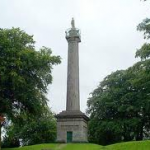 Situated on top of Fort Hill, Enniskillen, the tower of Cole’s Monument dominates Enniskillen’s tall scope. A series of 108 spiral steps leads to panoramic views. Open April to September, 1.30 – 3.30 p.m. Free entry. Multiscreen cinema showing all the latest releases. Corralea Water Park, Belcoo, BT93 5DZ. Total wipe out style water assault course on Lough Macnean. Open July to August. Booking essential: 028 66 386 123. The Forest Stables, 100 Cooneen Road, Fivemiletown, Co Tyrone. Trekking and riding for beginners to adults. Prices from £10.00. Adrenaline activity for the over 8’s and adults alike. JCB driving, mile long zipline course, off-road driving, blindfolded driving, zorbing, giant swing and monster slide. 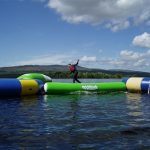 Watersports activities tailored to young adults and teenagers, courses available through the summer or day activities such as banana boating, canoeing and wind surfing. Fermanagh offers excellent forest routes and quiet country roads. For purpose made tracks, Blessingbourne estate in partnership with Phil Saxena the course designer for the Beijing Olympics, has created a family friendly mountain bike trail with five separate red trails coming off the route enabling bikers who wish to improve their skills, or seek adrenaline to leave the family route whilst parents can take the easier route through the spectacular estate scenery.